Constructed in 1867, this brick structure originally housed a blacksmith’s horseshoe shop. From the 1920s through the 1990s the property was a chocolate confectioner, who bricked up the large doors intended for horses and turned the windows into glass block. The current owners acquired the building in 2002 and it was meticulously restored by North Side architect Bob Baumbach in 2005-06. An open studio to explore, learn more about the history of this building from the current Owner, and the restoration to its current state. This building has served as a blacksmith shop, a chocolate production shop and is currently home to a design studio and a venue for events. The earliest records of the building were discovered in the 1867 and 1868 Allegheny City Directory which shows George Schneider as the owner working as a Blacksmith at the intersection of Middle and Second Streets. The 1868 and 1869 Directory shows John Schmittdiel of Schmittdiel & Co., Second and Middle and it also shows Schmittdiel & Snider, horseshoers, 61 Second. 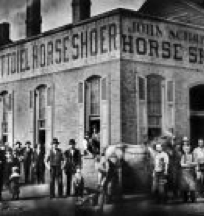 This suggest that George Schneider owned the horseshoeing business independently and then in partnership with John Schmittdiel. The circa 1870s photo attached to this description shows the original character of the building. In it, the Schmittdiel name is painted across the side of the building and there is a blacksmith shoeing a horse as children and neighbors gather on the sidewalk for the time-piece photo. An 1880 Census shows John and Sophia Schmittdiel, both age 40, living in the neighboring house (which is still standing) along with their 8 children ages 16, 14, 12, 10, 8, 6, 4 and 8/12 (months). Despite the crowded house, Marylin Eberhard (identifed as mother-in-law) also resides at the tiny house! An insightful document was discovered during the renovation which shows the type of services that were performed here. It is an invoice prepared by Sophia Schmittdiel from January 1st, 1884 addressed to Eberhart & Ober (then, the largest Allegheny City brewery) for the last quarter of 1883. It includes 185 shoes and other items for a total of $71.68. The document is beautifully arranged with old-world handwriting and identifies each of the German-named teamsters who steered the horses to the blacksmith shop for the billing cycle. The blacksmith shop and the adjacent house would be transferred a few more times until around 1920 when the Korinis family purchased the buildings and turned the shop into a chocolate production shop. They would sell their wares at the Allegheny City Market and when it was demolished, the family set up shop at a kiosk in the Northway Mall. By around 2000 the candy business had run its course and the buildings were sold to the current owners. The restoration took place in 2006 and has operated as a design and architectural studio since that time. In recent years, the building has hosted gallery openings, fund raisers, celebrations and group meetings. For the past two years it has served as a venue for the Deutschtown Music Festival.